Great for the golf enthusiast! Wrapped in crisp clear cellophane and topped off with a big handmade bow. We've also added cattails to come up out of the cellophane. Includes a Handwritten Greeting Card. 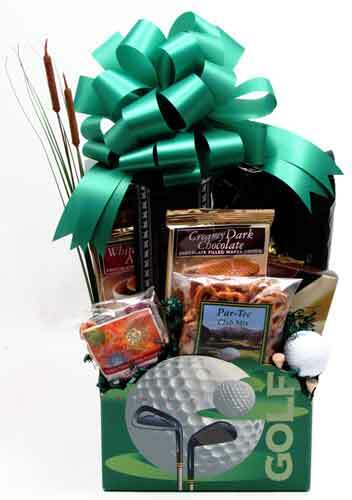 Filled with gourmet Par Tee Snack Mix, Almonds, Golf Ball, Wooden Tees, Cheese, White Chocolate filled Butter Wafer Cookie, Sliced Beef Summer Sausage, Dark Chocolate filled Butter Wafer Cookie, Crackers, and flavored Popcorn (English Toffee or French Vanilla).